I must say it’s been an interesting last 4 months on this blog as it pertains to comments. I wrote a post back in March saying how I was changing how I accept comments here, and much of what was on that post is above the comments box. What is this quest for good comments you might ask? And what makes bad comments? The quest for good comments is because it makes interactions relevant. A bad comment is one where I talk about colors and you come back and say “looking at colors is important on a blog” or something like that, and that’s all you offer; ugh. I deleted 3 of those from my previous post on being a colorful blogger. I know those are people being paid to write comments or people who are cruisin’ and could care less about their comment being responded to; I mean really, what can you say in response to something like that? The same goes for people who use “info” as the beginning of their email addresses. Once again, how do I know that the person leaving the comment is going to be the person reading the email? I’d bet that at least 75% of the time no one’s going to read the email because when I was letting those email addresses through in the past I think only 2 people ever responded to anything I specifically said to them. If this is you and it’s supposed to be legitimate let me teach you something about branding; that’s not how it’s done. You want people to trust you then you make sure you use “your” first name and the extension should be your website. That’s another point. While we all let these things go through, addresses that use gmail, hotmail, yahoo or the rest aren’t great for branding. If you want people to take you seriously, use a website or blog extension as the email, with your name or nickname at the beginning in some fashion. Let me say this; I’m not necessarily against people who write comments for a living. What I’m looking for is a bit more effort, an attempt to at least look legitimate as far as someone who might actually care about what’s been written. Yes, as a writer of multiple blogs, I like to think my efforts are being appreciated and not just a place where you get to drop a link to your client, or your own blog, with little effort. At least give people a reason to say “hey, that’s a great comment, let me go back to their blog to see what they’re all about.” After all, aren’t you really being paid for that, to help drive business, rather than just trolling for links? I’m not the only one who feels this way. Adrienne, whom I mentioned above, has a very strict commenting policy. My Hot Blog Tips buddy Brian has started doing the same thing and he’s even harder than I am. Sure, we all risk losing people commenting, our traffic going down, and our rankings suffering in some fashion. But those who are serious about things know that they can come here and, if they’re predisposed to do so, can even talk to others who have left comments because they’re pretty good, and yours truly has vetted them; oh yeah! Mitch, I’ve been tougher myself since your last post on comments. If there is no FACE or gravatar and I don’t know them they ARE going directly to spam, no passing go! I had one recently who commented on 50 posts and ended with see my blog at ….. I felt bad they spent so much time but with no gravatar and an ending like that- no way. Another emailed and asked me why. I told them, no gravatar, etc. Our blogs, are just that, Mitch, OUR blogs. We can decide. I did put a note on mine near the contributors but I should put a message somewhere else on the blog about comments. Now you got me thinking. Thanks for the mention BTW. I just deleted several "ify" comments a few minutes ago on a post that only has 3 comments. I don't care, I'd rather go with no comments that allow some of the stuff that people try to pass off as interaction. Oh, and I'm not using my middle initial but I think you stopped filtering that anyway. Wow, Mitch, I never thought that much about blog comments because I the ones I get are small in number and they usually from legitimate people stopping through. Thanks for enlightening me. Marcie recently posted…62 Blog Posts to Overcome Blogger’s Block Available is Now Available on Kindle! No problem Marcie. Truth be told, blog comments end up being the real life of a blog, and bad comments can be the death of it as far as search engines are concerned. So it definitely is a big deal long term. 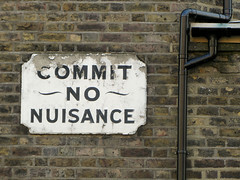 I promise not ever to commit nuisance in your comment space. Having said that, let me thank you for those very generous words. While it is indeed very frustrating not to see my comments published straight away after I write them, I know that you will pull them out of your moat and am therefore quite content. My Akismet does a reasonably good job of screening spam and those that escape fall under the categories that you mention. Silly sods thinking that they can escape my scalpel. They don’t. Occasionally, some interesting stuff gets written inadvertently by a spammer and I let it be. Nice post Mitch.<- No I am not a spammer. Ramana, you never have anything to worry about, and I like your blog because of how you tell stories. That’s what I’m saying in general; I like how you use language and others could benefit from doing the same thing here and there. The problem as I see it is that most people don’t read comment policies, including what you’ve written above your comment form. As you know in order for people to leave a comment on my Friday Funnies post they have to like and comment on my gift blog. It’s a one time thing but even so people still leave comments even though they haven’t fulfilled their obligations. At first I thought it was because I put the directions at the end of the post. I’ve now put it at the very beginning of the post. What does that tell me? That they were never, ever reading the post in the first place. I pretty much know the folks who come to my blog and post comments. If I don’t recognize the name and they don’t say they found my blog via a mutual acquaintance or they found me via Twitter (where I promote it), their comments are not posted. Bev, I don’t know why you won’t get a gravatar; wouldn’t that be a suggestion you’d make to a client for visibility purposes and such? As to the other, I obviously don’t ask people how they found me if they’re first time visitors. I know that most people find me through Google, as I’ve talked enough about checking Analytics and seeing where my traffic comes from. I don’t intentionally moderate comments for just that reason. Well Peter, you certainly tried enough unique ways to get this comment on here. lol At this point I know who you are, so I’d have pulled your comment out of spam. You’re right, the first time I saw the “b” name I did think it was spam; nicely written spam, but I was uncertain. That’s the risks one takes of having a unique nickname. But your email address is fine; not sure why you get tracked because of that. Actually Peter, there would. The problem isn’t people not checking their spam filters as much as the fact that some people get overwhelming amounts of spam. I don’t because I’ve taken certain actions, which I’ve talked in previous posts on the subject on this blog, that have helped minimize it drastically. So the bit I get is easy to get through, but it still involves both Akismet & GASP. I didn’t know people make a living from posting comments Mitch; guess I learn something new everytime here haha. To be honest, I didn’t think search engines paid enough attention/relevance to such links to make it worth it; I guess I was wrong. However, I have come across a few blogs – with no moderation – and with say 1000 comments on them. Therefore, if I ran a blog Mitch, I’d employ the same filtering as you do Mitch. The free email accounts are abit of a giveaway; but I think many of these comment spammers don’t even read the article, they skip to the comments, look at what someone else has wrote and rehash their text into something they hope may just be acceptable. Do it enough times on enough blogs etc. This is actually the only blog I regularly post a comment – once or twice a week – mostly because I enjoy reading your articles. Most blogs seem to create the same old articles you can read at another 100 blogs, whereas this blog has your personal experiences etc, and that makes it interesting and worth coming back to. Thanks for that Richard; glad to teach you something new at the same time. Like anything else there’s always someone willing to pay for something and someone willing to take that money. I actually have one client who asks me from time to time to go out and comment on their behalf, and I take the money. It’s rare and it’s certainly not a lot of money but it gets me out of my comfort zone and I know the topic well enough to leave good comments on the blogs I visit. I had no idea I was supposed to be using my website email. I better upgrade that email for more storage. GoDaddy gave me like 100MB with my site, so…I usually tried to stay away from using it. Mitch, it looks like your fed up with blog comments huh? I get em too..god knows why!? Because I have 0/10 Page Rank. So thanks for that tip. I’m an Amazon Affiliate myself. I hope that doesn’t mean I’m a scumbag commenter! *sidenote* Your “Notify me of followup comments via e-mail.” I don’t use that. I use it within the C”onfirm you are not a spammer” text like Hot Blog Tips Does. You might find a return in blog comments that way and might help you! *smacks forehead* I really need to look at my comment before I submit it. LOL! Obviously you had a lot to say on this one; some of it admittedly confusing. 🙂 Actually I’m not fed up with blog comments, even the bad ones. I write posts like this more to help educate those who want the information on the importance of culling out good comments from bad ones and real from fake. For the health of a blog, it’s an important thing to do and consider. As for affiliate, we’re all affiliates of something; well, most of us are. However, there are those people who leave comments and link back to a page that’s an affiliate sales page only, or something set up to capture another person’s email address by offering them something. That’s not quite a business and it’s definitely not a blog, and every once in awhile it’s a page that you look at and don’t want it affiliated with your blog in any fashion; I’ve seen some really salacious stuff come through over the years, and initially I never paid any attention to it because I was more interested in getting a comment than in checking those things; bad move. As for the gravatars issue, once again it’s more about education for me than anything else. When I was first blogging I saw them & wanted them, but kept looking for how to create an avatar because that’s really what they are. Back then it took awhile before one could learn what to do; it should be much easier now, and I even wrote a post to tell people how to do it step by step. If one is really concerned with their branding they’ll get it done. Paying people to comment on other blogs is just lame! I don’t get it, how much time will a simple comment take you? 2-3 minutes? It’s not like you have to be a scientist to build a nice comment and then follow it up. The real issue is that we are living in a “fast-food” society where everything needs to be done ASAP, and move on to the next activity (ie. find the next blog that you can spam). I feel sorry for these bloggers, instead of focusing on their content, they spend hours in this technique which I’m really not sure if it works out in their favor in the end. This is my first time here, and i really loved your honesty and transparency…many thanks Mitch!